Tahniah Kak Wanie yang baru menjadi tunangan orang pada 26 Disember 2009 yang lalu. Semoga ikatan yang disimpul akan dibawa terus ke jinjang pelamin. 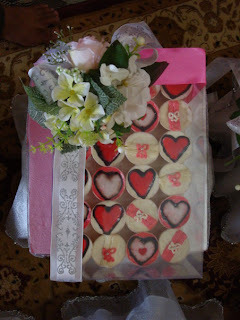 A customer from Perak had ordered 200 pieces of Choc Chip Muffins (single packed) for her sister's wedding. How shameful, the customer had the photos of the cupcakes posted much earlier than us. Anyways, Happy Birthday to your future mother-in-law, Tuan Azrul! The customer wanted the base to be all yellow, with Ribbons, Flowers and Hearts as decorations.